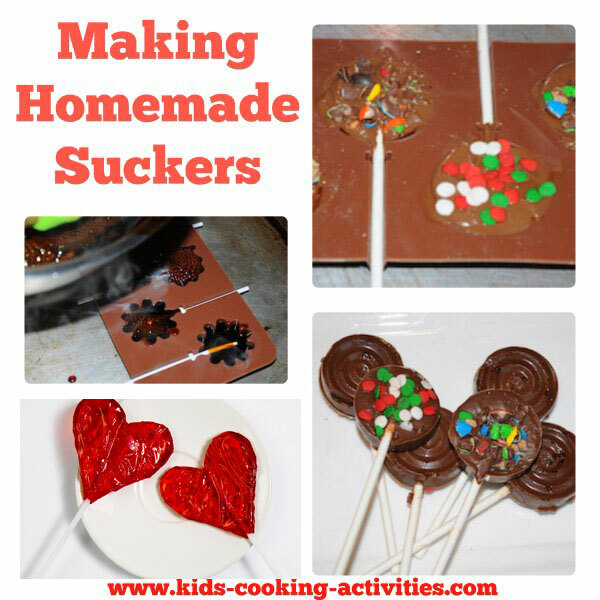 How to make homemade suckers or lollipops. 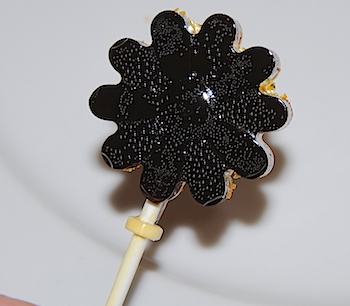 Suckers or homemade lollipops (whichever you call them) are perfect for any holiday or birthday. 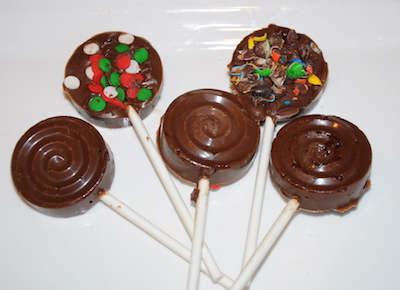 We have two versions of lollipops your kids can help you make. 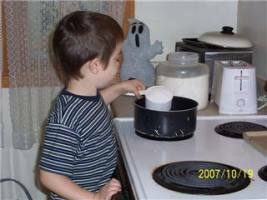 Younger kids can still help with certain steps but let the adult do the cooking on the stove and any handling afterwards. Here is how one mom got her 4 year old involved in helping. Thank you Cindy G. for sharing! 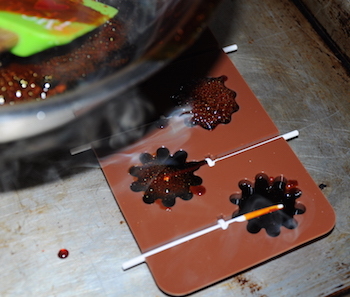 Put your sucker molds with the sticks in them on a cookie sheet. You can buy sucker molds made from silicone or metal. **Don't use plastic molds as the heat of the suckers will melt the plastic! Mix all the ingredients together in a saucepan. I let my son put everything in the pan before I turned the heat on. The stove wasn't on in this picture. Pour slowly into the molds. Don't worry about any bubbles, they'll go away on their own. 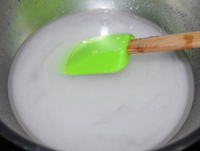 You can also put sprinkles on the suckers by sprinkling them on right after you pour the syrup into the molds, don't wait too long or the suckers will start to set up and they won't stick. Wait until the suckers are completely cooled and remove the molds. (be careful some of the hard candy can have sharp edges) Wrap them individually. We put them in little snack baggies so that they're airtight or the humidity ruins them. Enjoy, my kids did! Another way to make homemade suckers is using chocolate. 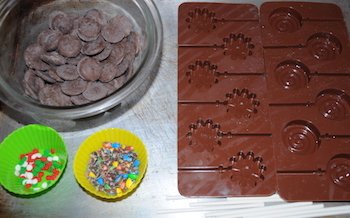 With these chocolate suckers, you can use plastic molds as well as silicone. In 30 second intervals melt chocolate wafers stirring often. Follow directions on package for more directions. With a spoon add chocolate into molds. Do not overfill and wipe excess around edges. Tap molds on counter to get rid of air bubbles. **If you want to add sprinkles or toppings do so while the chocolate is still wet. Place in freezer 10 minutes or until under side of mold is frosty.